How many satellites did you have before take off? Thanks where i will get the flight log.. I have samsung galaxy s7 edge (android 8)? Any path? Sorry i didnt noticed that. D) yesterday after updating the remote firmware, i tried resetting it to factory defaults which always failed through dji assistant upon multiple trials. Where to find the flight logs on android phone? Path? Here is the flight logs uploaded. Please help in locating it and finding the root cause. I can go looking for the drone again tomorrow. Please help. So is wind the reason for it not able to return to home or respond to my remote commands? Why didnt i get high wind velocity warnings? Your RC contact broke at the last known position with battery level at 2%. In GO4 use &apos;Find my Drone&apos; to retrieve the last known position. From there, proceed to WSW to SW direction because the drone drifted in that direction due to strong wind. Can we get approximate longitude and latitude for your suggested location? Yes - as the Mavic AIR is only capable flying 29 km/h in P_GPS. It was unable to fight the wind and return to home. In Sport mode the speed would be higher, (68 km/h) but i highly doubt that the aircraft would make it home. But i switched to sport mode on remote... Why it didnt engage then? This is only a very rough estimate! My guess is at the end of the yellow line. Good luck finding your drone. And yes, too much wind to handle, drifing 260 with a home heading of 75. Sorry for your loss. I hope that you find it. For the future use an app like uavforecast, it tells you the exact wind speed at the location where you are + it tells the wind speed at all the different altitudes, very usefull application. Please never take off with such strong winds, the end result will always be the same, loss of the drone! It just can’t handle such strong winds. Thanks everyone for your time and help. I will go again tomorrow morning and try to search. Problem is that its a vast farmland full of bushes and vegetables plants and trees, we cant see anything even if it has fallen just few meters away from you and you can hardly walk + the farmers dont want you to spoil their plants if you try to walk across the farm. Still i will give another chance tomorrow. Jjb spark.. Thanks for your response.. Based on this data and your experience can you guide me to an approx possible crash location. In which direction i should look, possibly how many meters? Any lat, long? Guess you know that area better than i do, so end of the yellow is the landings spot. I can see a &apos;road&apos; there, must be not that hard to go there. Sure brothers.. Pray for me.. I was totally disheartened by this incident. Hopefully i will find it tomorrow in a good shape. 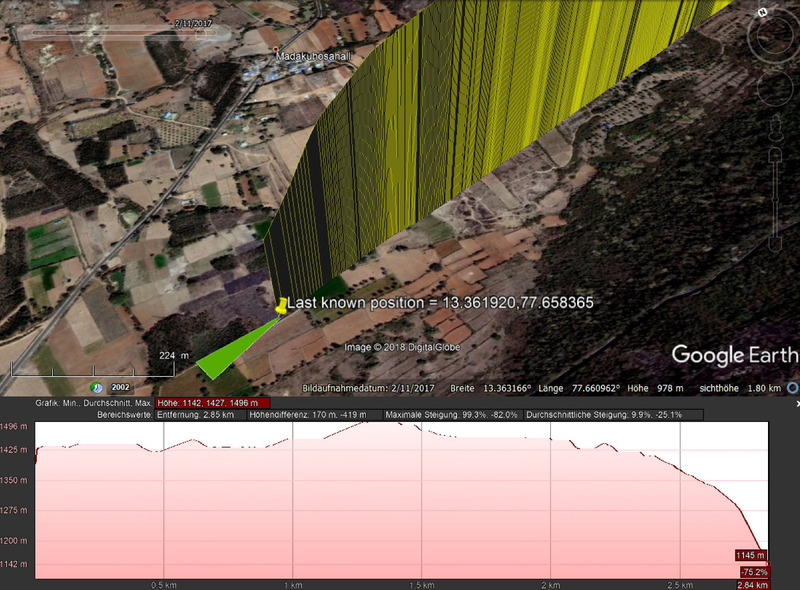 According to Google Earth your last known position was at 13.361920,77.658365 ~170m AGL. 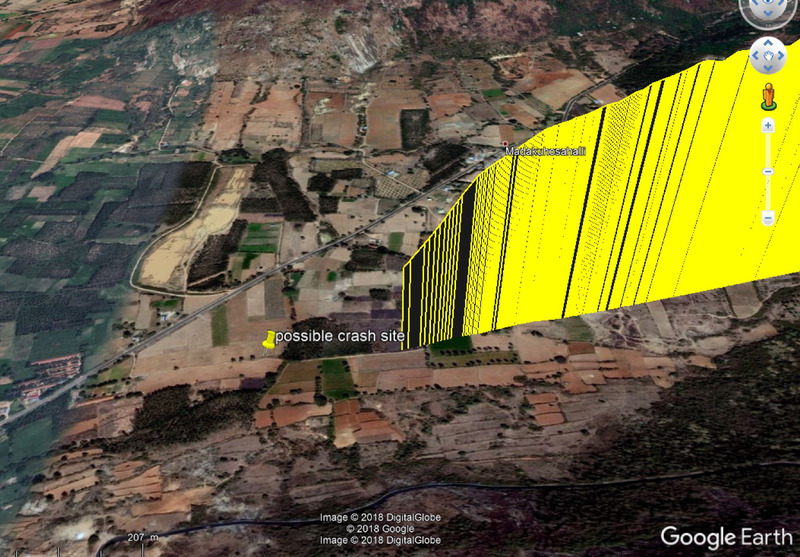 The aircraft was already in Forced Landing Mode and would not attempt to go home, only descending vertically. 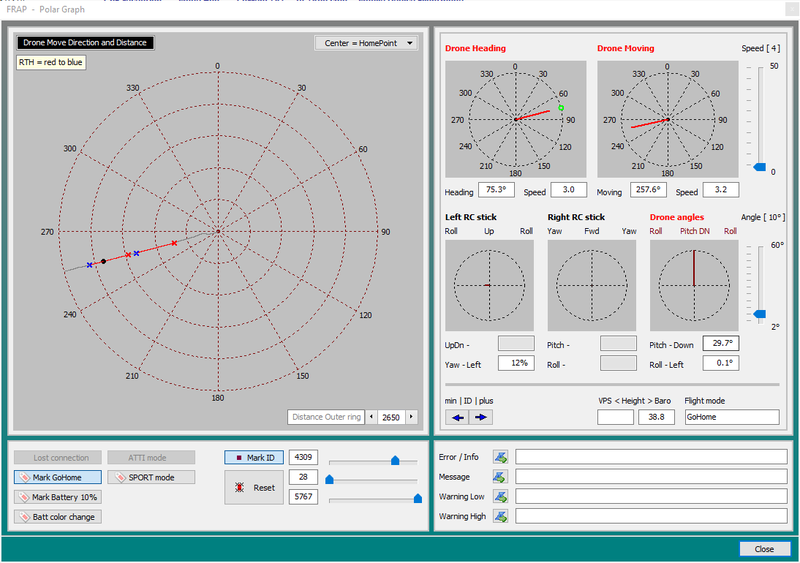 Airdata&apos;s wind calculator might be not correct with your negative height (-250m below take off point) but we can assume strong wind from NE. Looking at the remaining battery, there is also high possibility that the aircraft shutdown completely before it reached the ground and crashed. Here the map with the .KML data from your logs. Start searching at the east tip (Last known location) of the green triangle an continue looking to the western part. 1. Do not use the aircraft in severe weather conditions. These include wind speeds exceeding 10 m/s, snow, rain, and fog. General rule of thumb - 15mph winds is the limit for the Air. Yes, It can handle a little more but you may end up as per this post. Hope TechVoyager manages to find it and use this as a lesson learned. 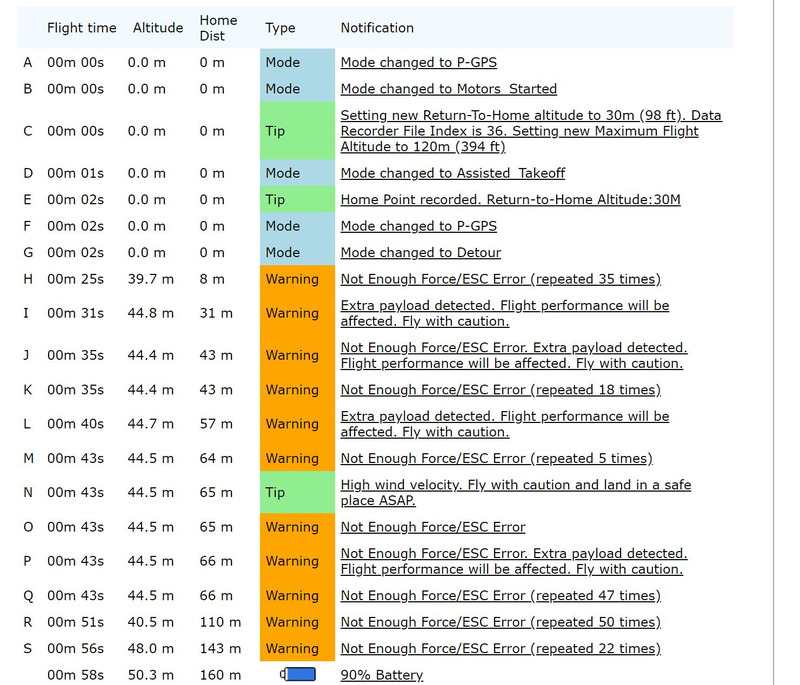 Which program are you using to analyze the flight log? Hope you find it, particularly if you have care refresh. Looks like wind was your nemesis, wind can do some very strange things around mountains. I think when flying in the mountains depending on which side of the mountain you fly, it can be very windy or very calm. Hey, he didn’t even do the basics and check for a decent number of satellites. Sorry for the loss but there were some pretty fundamental mistakes made with this flight. If you find your drone, or buy another, do some (a lot) more reading before you go flying again. As the moving air is pushed over a mountain range it is squeezed between the mountains and the top of the troposphere, causing the wind to speed up. Please provide Link(s) to where it states wind speed increases due to air being squeezed between mountains and "top of the troposphere". I’m asking for the last time stop trolling me and trying to turn this thread into something it’s not. Have a bit of respect for the OP. Now skip along, I won’t be answering any of your daft and off topic questions. 1) Not my fault that people post something to a thread you have posted in, moving thread to Top, with said thread then slowing moving downward as people post to other threads. 2) You think far to highly of yourself. 3) Not my fault you post some B.lowing S.moke stuff. And I ask you to back it up, and you can&apos;t.
4) Your attempts to blame me, fall right back on you. You are one introduced B.lowing S.moke stuff about why wind speed increases. 5) Very lame attempt to play victim, being you are King of Trolls. 6) And, I will challenge you when you post B.lowing S.moke stuff. Not for myself, but for others who may read your B.lowing S.moke and make mistake of thinking you are correct. 7) We all have a responsibility to stomp down Internet Myths, which spread to eventually become self-sustaining Faux Facts. Now, if you can politely provide Link(s) as I politely asked. If not, Deal with it.